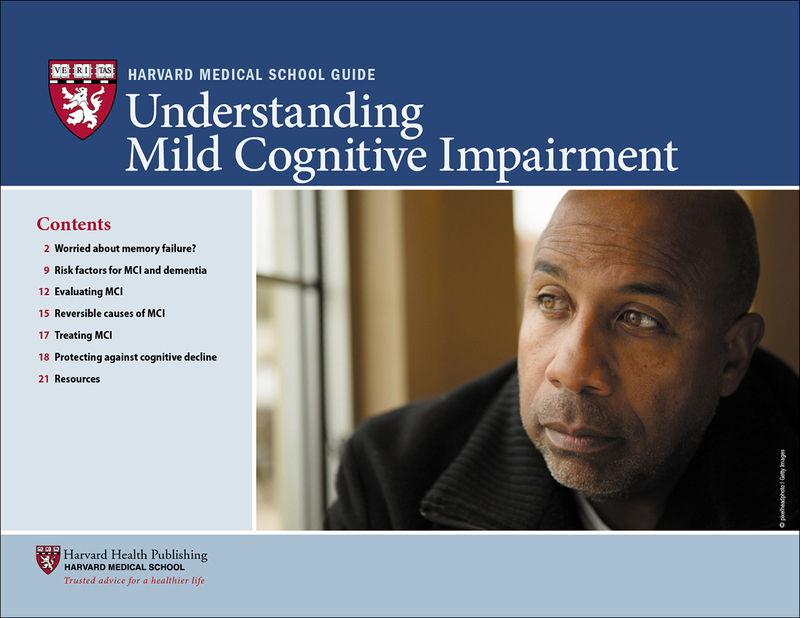 This Harvard Medical School Guide explores the subtle differences between various forms of memory problems, breaks down the different types of MCI, and explains brain function and its role in creating and retrieving memories. You will learn the causes and risk factors for MCI, what doctors look for when diagnosing the condition, and medical as well as natural ways to treat or even prevent it. concern, it may be a sign of Alzheimer’s disease or some other cognitive condition. Early diagnosis helps you better plan your future. symptoms and observations. In addition, MCI is a highly variable condition in which a person may either progress into actual dementia, revert to normal cognitive function, or even remain at a stable level, depending on the individual and the conditions underlying the problem. memory problems, break down the different types of MCI, and explains brain function and its role in creating and retrieving memories. You will learn the causes and risk factors for MCI, what doctors look for when diagnosing the condition, and medical as well as natural ways to treat or even prevent it. Memory and learning: Holding information over the short term while performing a task (working memory); registering new information and storing it for future use (acquisition, also known as “encoding,” and consolidation); accessing information from storage when needed (retrieval). Social function: Interpreting and responding to social signals from other individuals such as facial expressions and direction of gaze. Language: Translating sounds into words; generating verbal output; comprehension of written and spoken language. Perception and motor skills: Recognizing and interpreting sensory stimuli (smell, touch, hearing, etc. ); mobilizing your muscles and body; manipulating objects; navigating your environment; perceiving and interpreting visual images and shapes. Attention: Sustaining concentration on a particular object, action, or thought; managing competing demands in your environment. cognitive control and response inhibition—the ability to withstand distraction and internal urges.